St Giles’ Fair rolled into town last week and this is the first of what will probably be quite a few blog posts of pictures shot over the three days (including setting up). This year I only used black & white film for a change. It was nice to see some familiar faces again and as usual there was lots going on and plenty to photograph. I missed the fair last year so I was crossing my fingers for nice weather this time which we were fortunate to have. 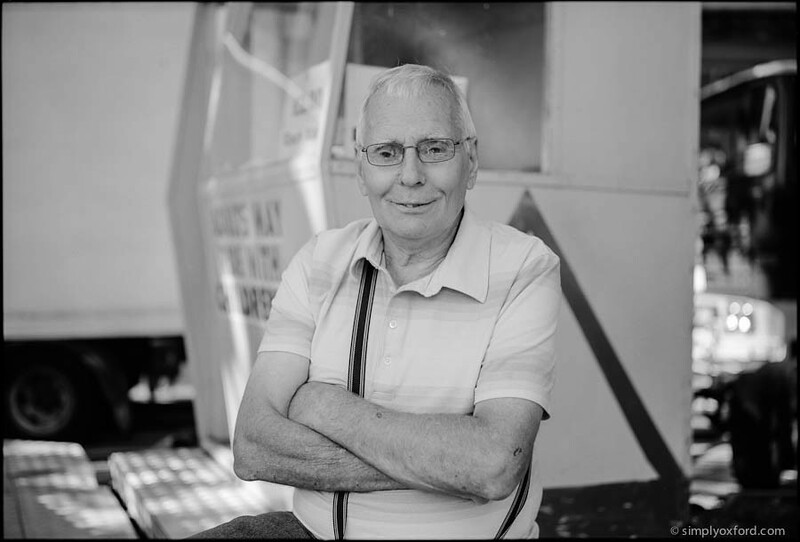 In the second shot down you can see Tommy Noyce who has been visiting St Giles’ Fair since he was 6 years old. He is now 73. The well known galloping horses carousel has been in his family for three generations and takes five trucks to transport. 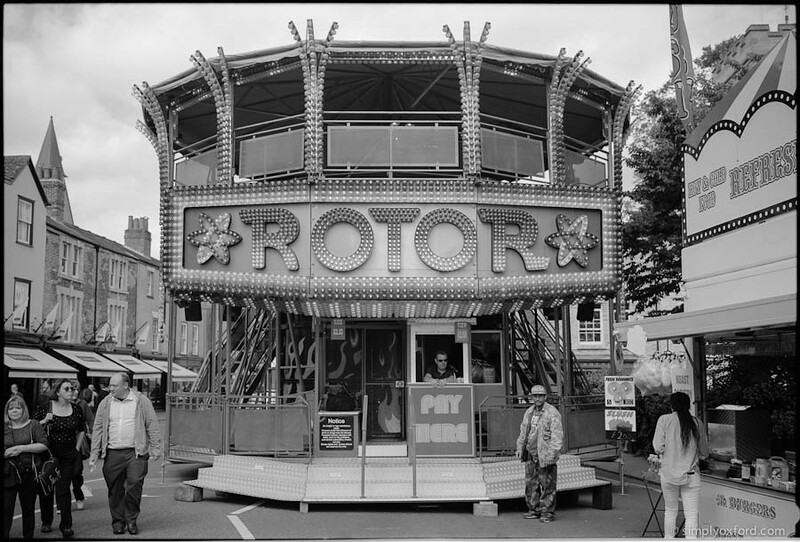 Sadly it no longer comes to St Giles’ Fair. 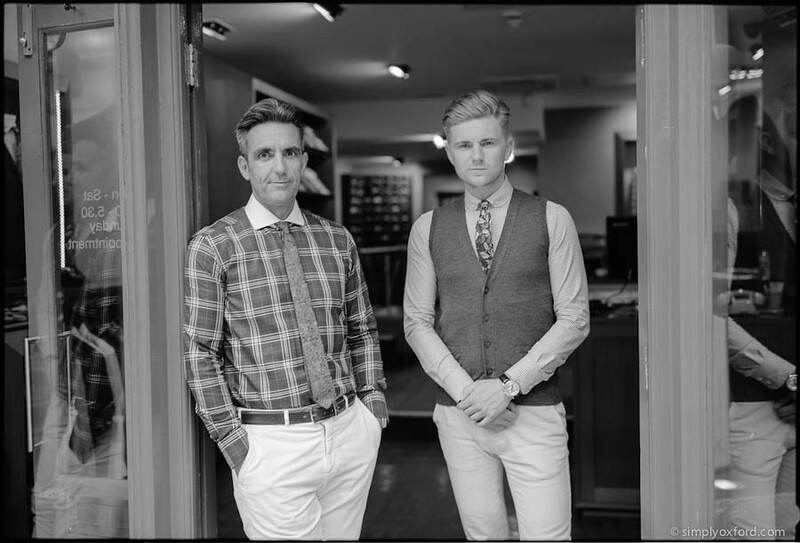 The last frame below was made on the way back to my office during my lunch time visit to the fair – two of the tailors from Clements & Church on Little Clarendon Street. [Tech info:] Fuji 6×9, Neopan Acros 100 developed in Rodinal 1+50 for 14 mins. On day 2 of St Giles’ fair there was less rain than the previous day but the sky was a lot more overcast which made the light level quite dark and dull for photography. 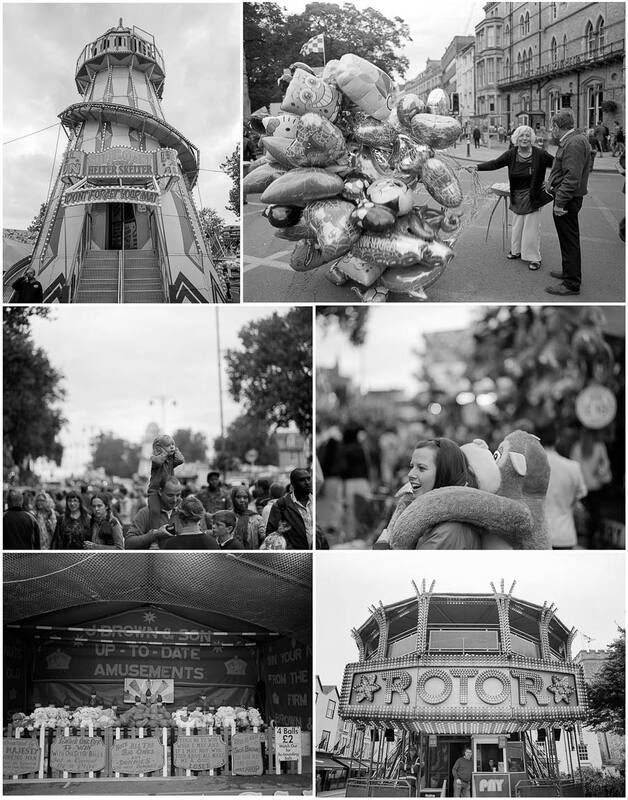 Here’s a selection of my shots from day 2, there will be others to follow that I made with 35mm once I receive them from the lab (aka Asda). You can probably tell that the Rotor is one of my favourite rides to photograph and I think it looks great in both black & white and colour. [Technical info:] Pentax 6×7, 55mm and 105mm lenses, loaded with Ilford FP4 (expired), processed in Kodak Xtol. 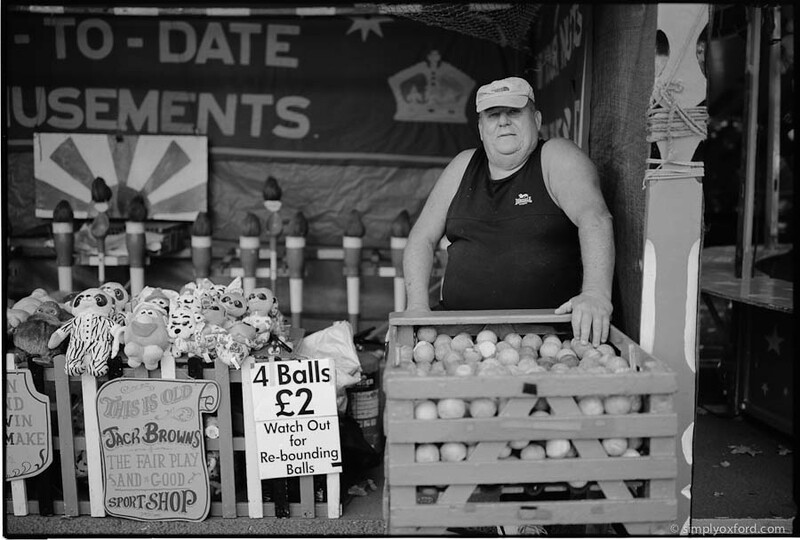 The fair rolled into town last sunday and I went along to photograph some of the rides and stalls being set up, more specifically the people doing the setting up. 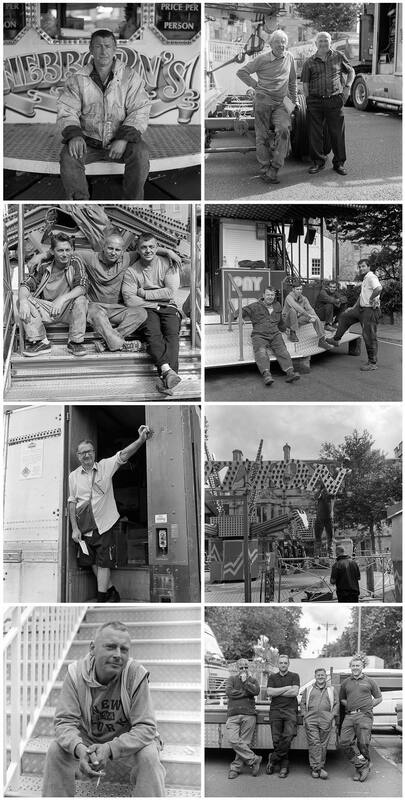 St Giles’ fair is always held on a monday and tuesday at the beginning of September and the set up is always done on the day before. Last year I went along and saw the potential for lots of great portraits but I only had a small camera on me and from past experience that dramatically reduces the chances of me receiving a positive response when approaching strangers on the street to photograph. It was then that I decided I would go better prepared this year and so I did with my Rolleiflex twin-lens medium format camera. I’m still trying to get comfortable with handling it and I’m not 100% with it yet so I’ve been trying to use it as often as I can. Overall I think I only received a handful of rejections from people that didn’t want to be photographed which was a shame because there were lots of guys there that would have made really interesting portraits in black & white. Maybe next year. This is the entire contents of a roll of film that I shot, all 12 frames. [Tech info:] Rolleiflex 2.8f loaded with Kodak Tri-X (expired), processed in Kodak HC110B for 7:30. 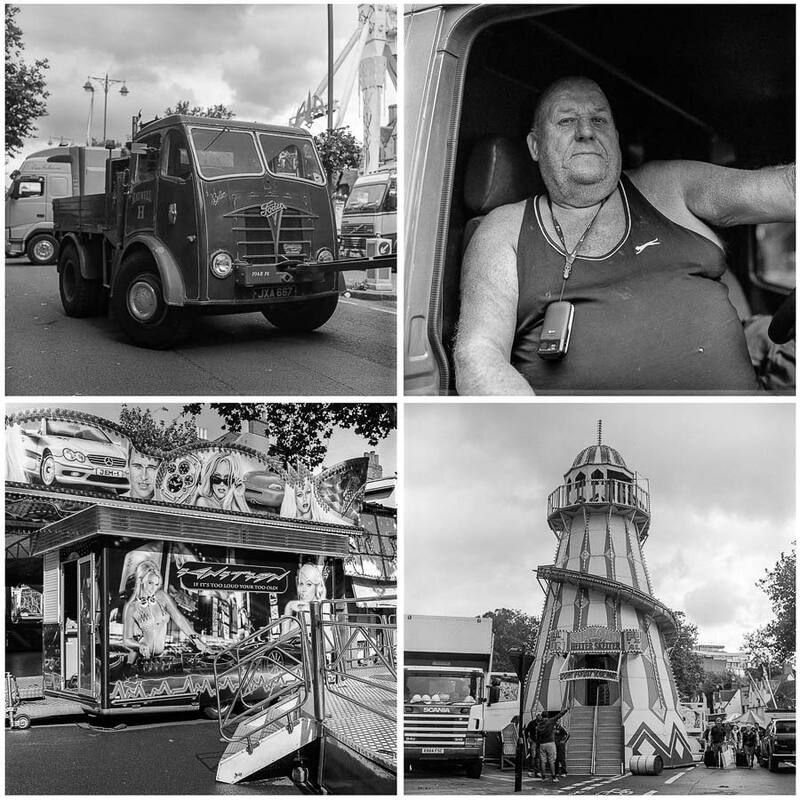 The fair has just rolled into town along St Giles so I went along there yesterday to see some of the rides and stalls being set up. 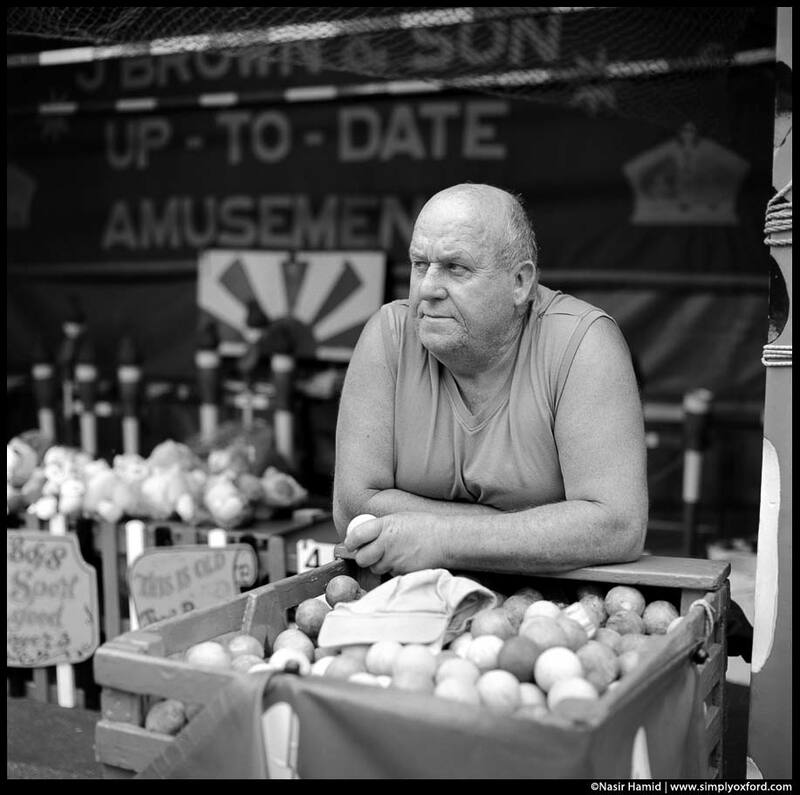 I can remember the images I made there last year, one of which was a man on a coconut shy stall who is back here again this year. When I saw him setting up yesterday I stopped to say hello and he remembered that I had photographed him last year. After looking back at my previous posts I notice that this shot of that man didn’t get posted for some reason so I’m posting it here so that he can see it. I’m hoping the weather will stay dry long enough for me to do some more photography at St Giles’ fair over the next couple of days. [Tech info:] Rolleiflex SL66, 80/f2.8 lens, Fuji Acros 100 processed in Rodinal 1:50 for 10 mins. 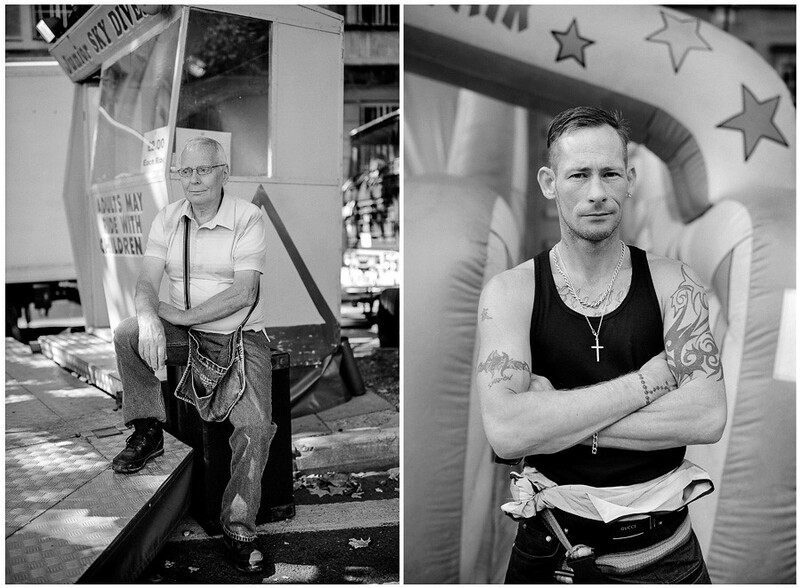 More images that I made during St Giles’ Fair at the beginning of September. This is the contents of an entire roll of medium format film, 12 frames, none deleted. [Tech info:] Rolleiflex SL66, 80/f2.8 lens, loaded with Fuji Acros 100 film, processed in Rodinal 1:50.